A small group of us descended on Subterra in Newberg on Friday night for dinner and special wines. The occasion? We were the growers and buyers of a new vineyard on Ribbon Ridge that will be the primary grape source for Vincent Wine Company in 2010 and beyond. I'm thrilled about the site and working with these new and enthusiastic (like me) growers. And if wine dinners with this crowd approach this night's line up, I'll never miss a gathering. To start, NV Bouchard Champagne Infloresence that was more fruity than I recall from my last time trying it in December. That's no knock. This just showed more exuberant fruit along with great chalky, minerally flavors. Really nice stuff. Next came an oddity, the 2004 Ponsot Morey St. Denis Clos des Monts Luisants Blanc Vieilles Vignes, an all or nearly all bottling of aligote. It showed some oxidation at first, then revealed more depth and lots of nerve from the acidic aligote grape. I really enjoyed this wine and would have gladly spent more time with it. Then the 2001 Deiss Schoenenberg Grand Cru, sweet and golden Alsatian wine that may not have the cut and precision of other producers, but I loved it. My contribution was the 1997 de Montille Pommard Pezerolles, a wine I brought as an example of hot vintage pinot noir (given our recent propensity to hot years here in Oregon, specifically 2009). At first there was a very Oregon black fruit and earth aroma. Not surprising, somewhat, given the historic dominance of Pommard clone pinot noir here in the Willamette Valley. With time it showed more Burgundian earth and minerality aromatically. In the mouth, it was always taut and Burgundian, lacking the sweetness of Oregon wines while still showing great fruit and integration and freshness. This is young de Montille, yet it's open and simply delicious. I wish I had more of this. To compare, we had a 1993 Gaunoux Pommard Rugiens, which I admit I didn't spend enough time with. Classic old school red burg here, floral and meaty fruit aroma, taut in the mouth and subtle. This is one of those wines I'd love to have in my cellar but I didn't spend the time necessary to cozy up with it tonight. Why? I was excited to try the 2008 Ayres Pinot Noir Pioneer, all 667 clone from Oregon's Ribbon Ridge and an impressive showing. Obviously much more sweetly fruited than the Burgs, but showing a depth aromatically and length in the mouth that suggests long aging and development. Which just about sums up what I think is so promising about the 2008 here in Oregon. Don't be fooled by the primary sweetness of so many wines. They will unfold, and have the balance and structure to hold together for many years. Then the 2008 Luminous Hills Pinot Noir Lux from the estate vineyard southwest of Carlton in Oregon's Yamhill-Carlton district. Blind, I thought this was 2007, and really, really good 2007 wine. Why? The light color, the perfume and the wine's lacy elegance. This is unlike any 2008 wine I've tried so far, clearly from a producer who's not looking for extraction or color. In some respects, I don't know how '08 didn't give something more dense and purple. Yet there's great intensity here, aromatically and on the palate. This should be long lived and makes me think again how I approach everything from when to pick to how warm to ferment. I really liked this and it made me think, a lot. Finally, a special selection for dessert, the 1986 Ch. d'Yquem Sauternes. I don't recall ever tasting this bottling but it showed true to many notes I've read. Fresh, young, lacking the power of great d'Yquem vintages....but I simply loved this wine. What balance. There's plenty of sweet botrytis yet there's refreshing acidity and a long, long finish. The wine is medium gold in color and showing similarly youthfulness in the mouth. Hold for a while yet. I bet another decade or three with bring out an intense caramelized sweetness that gives it more power. For now, it's simply excellent and an absolute treat to drink. With that, we resolved to have many more dinners of similar quality. I'm in. Who's with me? If you follow me on Twitter, you might have seen a few weeks back when I mentioned a ridiculous deal on Chianti at the new Whole Foods in my NE Portland neighborhood. Savignola Paoline is a Portland favorite, in a town that knows and drinks all sorts of Italian wine. Here was the 2005 Paolina Chianti Classico for $8 a bottle, half the usual price and with an additional 10% discount possible if you bought a case. I did and I'm wondering if I shouldn't have bought two. Even at the regular price, Paolina's basic Chianti is always a nice buy in traditional savory and rich Tuscan sangiovese. At about $7 a bottle, it's an absurdly good buy. Tonight with homemade lasagne, we try this dark garnet beauty. Fragrant pepper, strawberry and black cherry essence, winey and clean but nicely rich with meaty, earthy shades. Then dusty peppery black cherry, almond and mild balsamic flavors, rich and round but finishing long with cleansing acidity and fine tannin texture. I like this on its own as the lasagne cooks. I love it with the meal, just as good Chianti should be. I think the super discount is done, but this would still be worth your time at the regular price now or anytime you come across the producer in the future. Today my wife and I went for a terrific bicycle ride around the Willamette River in downtown Portland, then down the Springwater Corridor along the Willamette to the Sellwood neighborhood. After, we went to a cafe on Division St. for coffee, tea and sweets. If you think it always rains in Portland, be sure it only rained on our drive home. Otherwise, mild and simply perfect conditions for an afternoon by the water. Tonight, homemade spinach and goat cheese fritatta and a few wines, all in small bottles. First, an appertif of NV Ruinart Champagne Blanc de Blancs. This bottle had great sparkle and a fresh color, but it's clear it was an older bottling. Not the fresh lime and apple notes I see in so many reviews online. Rather, mushroom, dough and fresh apple aromas, more like a note from an aged vintage Ruinart bottling. The wine was fresh in the mouth, bright and lively but clearly mature flavor-wise with mushroom, nuts and yeast. I can't say this was representative of typical bottles, yet I loved it and didn't find anything bland, as some reviewers note. Then a half bottle of our 2006 Vincent Pinot Noir Wahle Vineyard from Oregon's Yamhill-Carlton District. How do you write a note of your own wine? You don't, except to say it was powerfully fruity with surpring oak influence for having been aged in 5 year old French oak. This isn't my style of pinot, but it's fresh and tasty. I can't complain. I think it's good, ripe vintage Oregon pinot. For dessert, a glass of 2001 Domaine Trapadis Rasteau Vin Doux Naturel, a true AOC Rasteau dessert wine from mostly grenache and some syrah, carignane, cinsault and mourvedre. This is lightly fortified to 16.5% with some residual sweet, much like Banyuls and Maury. I simply love dessert wine like this. Deep ruby color, plummy, spirity aroma with loads of pepper and spice, then a modestly sweet, grenache vintage port-like flavor with lots of ripe tannin and long, lingering flavors. This smells like it's maturing a bit but the tannin will take several more years to resolve. Still, this is delicious, robust but savory sweet wine. No candy flavors, nothing bitter, just a lovely balance of flavors. Terrific with chocolate and my sweetie. So who noticed when this humble site turned five years old last Thursday? 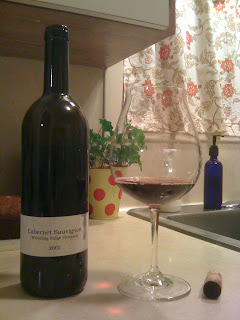 Yes, the first post was February 4, 2005, recounting a tasting at Liner and Elsen in Portland of mostly 2002 Oregon Pinot Noir. Things have come a long way since then. In 2005, I decided to begin working formally in wineries at harvest to better learn the winemaking process. Now I make my own wine commercially, and the blog archive chronicles how that all came about. The plan is to continue writing this blog for years to come, but before we look too far ahead, I thought it would be interesting to go way back in my winemaking archive to see where we've been. Yes, cabernet from the northern Willamette Valley's Ribbon Ridge AVA here in Oregon. I picked the grapes myself in late October 2002, all 40 pounds or so on a golden autumn day after a protracted Indian summer that we've hardly seen since. This was back in my Giantdynamics days. For several years, by some strange coincidence, I picked grapes for home winemaking on the final day of the San Francisco Giants's season. Usually that's early October. But this especially bittersweet year it was a horrible late October day, the day after Giant manager and my childhood hero Dusty Baker took starting pitcher Russ Ortiz out of Game 6 of the World Series in the seventh inning with a 5-0 lead and GAVE HIM THE GAME BALL. It was awful. How could he do that? Of course the Giants came unravelled, lost, and the next day, my picking day, they lost again to lose the series. Season over. Not that I'm still bitter or anything. But sweet things were happening then. My son Martin was born just days later, my sweet Mother here for many days looking after our young daughter, her namesake, and us through it all. And of course the sweet chardonnay I picked that day, to make my first white wine that didn't turn out so well. And the cabernet that called out from a few rows over. Ever heard that phrase "ripe for the picking?" Here it wasn't metaphoric. The cabernet was 22.5 brix, clean and beautiful. I had no idea what it would be like, so I stupidly took only 40 pounds at $.50 a pound. Twenty whole dollars. I destemmed and lightly crushed it at the vineyard, took it home and fermented it naturally in the basement in a bucket I used to make beer in. No yeast, no dry ice, no yeast nutrients, no ML starter, no nothing. It fermented for about 14 days and I pressed it by hand and got three gallons of wine. I aged it for about 9 months and bottled it by hand. It always smelled nice and tasted crisp like a Loire cabernet. Ok, you can't see too much. Let me assure you the color is indeed fresh though showing some rightful signs of age. The aroma is better than ever, with maturing raspberry and light cassis notes, a little hummus and smoky earth notes. The flavors? Light and crisp as it was young, but filling out in the middle and finish. Think a light Chinon with a little Oregon fruit sweetness. There's hardly any tannin, not that there ever was much. In all, I really like it and am honestly surprised at how the wine has held up and come together over all these years. Is the lesson that late picked, three gallon batches of glass aged Willamette Valley cabernet will age well for a decade? I do still have four bottles and this will certainly last a while yet. No. Rather, something unremarkable in its youth that has grown into itself and perhaps become more palatable with age is something we all should strive for. It really can happen. Just think of how much better my pictures will be in 2015. 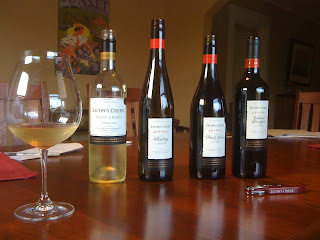 I was offered some samples of Jacob's Creek wines from Australia from a stateside marketing firm. The deal - taste the wines and pair them at your Super Bowl party with some interesting recipe or preparation, then write about it. Some might call it a crass marketing ploy. I thought it would be kind of fun, especially if we had some neighbors over who aren't nearly as wine geeky as I am. And it was. So here we go. Four Jacob's Creek wines showed up right before the big game. I wasn't sure if they'd make it, and I was set on making Belgian sugar waffles for the event (with lots of encouragement from one particular neighbor). The wines made it. We knew they wouldn't go with sugar waffles. But plans were in motion so we went ahead, even though that wasn't exactly the point of the whole thing. Really though, what wine do you want with sugar waffles? What beer would you want? Me, I think coffee or tea would be best. But the big game (said in Homestar Runner's voice), you need some colden ones. So wine it was. How did it go? The results were mixed, meaning we loved the waffles and seriously enjoyed one of the wines. The others met a mixed reaction from the group. I didn't really like them, but it was interesting seeing how others found things they enjoyed. First, the 2008 Jacob's Creek Pinot Grigio. This was really good wine, especially for the $6 you might find it for at the supermarket. Clean, melon, pineapple and white pepper smells, soft and round but tangy in the mouth and pretty dry. One neighbor commented it was "brief" but we all agreed this was the winner of the line up. Who would have guess. You say Australia and I think riesling, shiraz, and muscat. I don't think of grigio. This is more enjoyable than a lot of more "serious" grigio out there. Mom would love it. Then the 2008 Riesling Reserve. I've enjoyed the Steingarten Riesling from Jacob's Creek, one of Australia's more serious white wines. This however wasn't up to that one. There were some interesting petrol and spiced jelly candy aromas, but the flavors were all white grape juice and flat. One neighbor summed it up well - "the smell is much better than the taste." 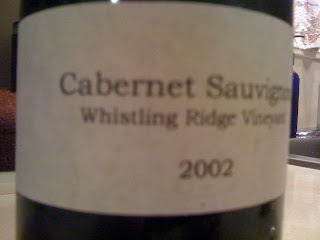 Finally, the 2005 Cabernet Sauvignon Reserve. This wasn't bad in its idiom, yet I was surprised that no one else cared for the wine. This has a strong cassis and blackberry pie filling aroma with charry oak and some light green pepper notes. Essentially, typical pumped up new world cabernet. Not my style, but it was clearly cabernet. The flavors were similar, though the round rich palate turned a little harsh, something I find with lots of large production, big cabs like this. I can see people loving the concentration of flavors, the syrupy mouthfeel and overall largesse. Yet everyone else was going back to the grigio or even the pinot. Very interesting. I wouldn't have guessed that. What about the sugar waffles? I didn't get a picture, but you can see more here, along with the recipe. Who knows who writes the Feeding the Boys blog, but this picture alone made my mouth water, remembering street vendors in Europe selling these lightly sweet, yeasty eggy afternoon treats. I can't recommend highly enough that you make them, assuming you like waffles and caramelized sugar and life itself. For the sugar, you can buy expensive fancy packages of chunky pearl sugar. Or you can cheap out and chop up sugar cubes into pieces. Works for me. Again, they won't match with many or any wines, but who cares. They were great, so was having a group try these wines, and so was the game. I've been working on blending trials recently in a small group with a friend's wines. I've done it before but it's invaluable experience. It's all about tasting through barrels, taking notes, then talking about the wines, culling out any problem barrels, highlighting standout barrels, talking about how things might blend together, putting together hypothetical blends, talking about stylistic and market decisions, how much wine in a particular blend, how much new or newer oak, what's typical and not typical of a particular grape variety, where were the grapes grown, when were they picked, how were they fermented and aged, what's the price, who's going to buy it, where's it going to be sold. I'm feeling really good about all this because I'm not brand new to it anymore. I have lots to learn, but it's nice not being a rookie. I can't wait to do this with my own wines, though even this year with nine barrels there won't be much to trial. Yet there's so much more than tasting and blending. I learn so much about winemaking and logistics down to marketing and distribution. It's fascinating and though my head's clear from spitting all the samples, but mind's swimming in all that information. We'll do more soon. I can't wait.